It's not worth buying ready made one. I've never thought it was tasty, like home made one. This recipe is one of our favorites. 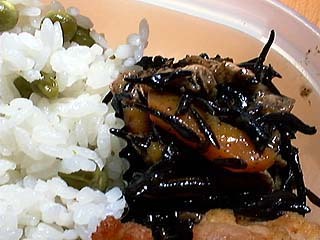 Actually I didn't like Braised HIJIKI Seaweed before. To be frank, the taste didn't suite me. It's much too sweet, dry and tasteless. But finally I figured it out because of mostly ready made ones' bad taste. But I was amazed it was tasty when I cooked it myself. And I can get fresh HIJIKI seaweed easily and in a low cost in Kyu-Syu(northern Japan). Then it became one of our favorite dishes. Atsushi and Satoshi say "It doesn't looks good, especially the coloring. But, having one bite, "hum.....more HIJIKI seaweed please". Home made taste wins again. If I don't add chicken to this recipe, growing children will be angry at me. After soak in water to reconstitute, boil it in hot water for about 1 minute. It takes the smell out. There is a big difference between doing this and not doing this. Cut chicken into about 1-inch pieces. Cutting chicken into small pieces is difficult and I freeze it slightly and then cut. It's a good way. Cut carrot into small pieces like the chicken. But if you cut it smaller, the texture might be tasteless. Be careful. I didn't put Abura-age's picture here, the cutting size is similar to the carrot's. I don't think it 's necessary to ABURA NUKI* Nobother, nobother. * In a shieve wash with boiling water. Stir-fry chicken till the surface color changes and then add carrot. Add Hijiki seaweed and Abura-age. Add Sake and soy-sauce and keep stirring a few minutes and then add Dashi. The Dashi is very important for the taste. It makes the taste enriched. If water is substituted for Dashi, the taste is completely different. Sometimes it's bothersome to shave Katsuo-bushi(dried-bonito), so I do an easy way to make Dashi. Put 2 packs(6g) katsuo-bushi in 2 cups of hot water for 3-5 minutes. That's it. Very easy. But Dash is necessary for this dish, you'd better prepare Dashi. It is the main-point of his dish. Boil it for 3-5 minutes after adding Dashi with a lid. And braise it without a lid for about 10 minutes. Remove ingredients to the edge of the pan using cooking chopsticks. If you can see the bottom of the pan with a little sauce, and then turn off heat. For lunch-boxes, braise more like the picture. For dinner, kind of watery one is tasty. I can't stop eating the no-sugar taste Hijiki seaweed. Just to use Sake is fine for seasoning sweetness, I think.